“One of the biggest challenges we face as teachers is assessment of independent reading.” (p55) Can I get an Amen?! How can we be sure that our readers are thinking while they read? 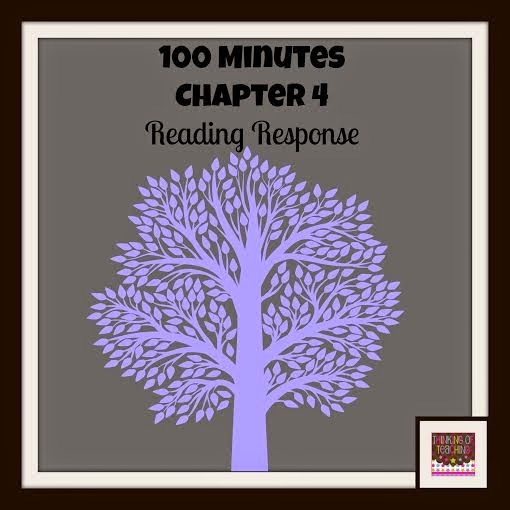 Chapter 4 of 100 Minutes really helped me think about my students’ reading responses. I really do believe that reading responses are a spectacular way to fit in some extra writing practice. They’re so multi-purposeful and lovey. There’s nothing I adore more than writing about reading. They’re two of my faves! In this chapter, Lisa discusses how to slowly integrate reading responses into student’s workshop time. “The gradual release of responsibility is created by initially working with students directly through guided reading and then immediately following with a reading response.” (p58) Superb. By providing this structure to readers, they understand the purpose of the reading responses; something that is frequently lost during this process. Lisa does a great job of sharing great reading prompts and different possibilities for how students can respond. What I love, is that reading responses go with everything- not just reading. Read aloud? Check! Science? Check! Social Studies? Check! In each area there is the opportunity to read and respond. While reading this chapter, low and behold, I came across this article via The Colorful Apple’s Facebook page. 10 Authentic Ways to Hold Students Accountable for Reading at Home. I think this does a great job pointing out some fun ways to make responses purposeful. As adults, we make sense of reading on our own, but our students are still learning how to do this. How do you make sure students are held accountable for their learning? There are a few guidelines that Lisa Donohue and her publisher have asked that people follow. Anything created for 100 MINUTES should be shared for free. Please cite the complete publication information: “100 MINUTES, (2012), Donohue Lisa, Pembroke Publishers” in order to make it easier for others to find the book.